The Dutch University Institute for Art History in Florence has scanned and posted its photographic documentation mainly by Benedict Nicolson and Hermann Voss. This database contains around 50,000 entries, including some unpublished works. The wealth of material and prestigious origin of the documents (Nicolson and Voss’ notes are reproduced in the entries) make this an invaluable tool for researchers. The Birmingham Museum and Art Gallery has just published a database listing its collection of pre-Raphaelite works, one of the world’s biggest. For now, this includes 2,257 works out of a total of about 3,000 (let us point out however, that the numbers vary widely as another page on the site mentions 2,000 works). Eventually, they will all be part of the database, whether they be paintings, drawings, engravings, photographs, books or art objects. The “multicriteria” search option is very practical and efficient. 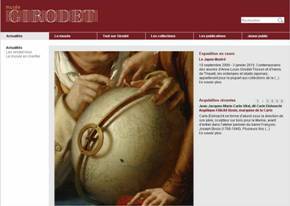 The Musée Girodet finally has a web site. Besides practical information and the usual news on current offerings (notably exhibitions), it presents a list of museum publications which are still available, an illustrated biography of Girodet written by Sidonie Lemeux-Fraitot and a very brief, for the moment, view of the collections. The number of photographs should increase in the next few months and we hope that this database will eventually include all of the museum works (which will then require the introduction of a search engine). 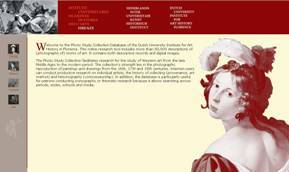 The site The Essence of Line was posted at the same time as the exhibition The Essence of Line : French Drawings from Ingres to Degas organized in 2005 by the two main museums in Baltimore, The Baltimore Museum of Art and the Walters Art Museum. 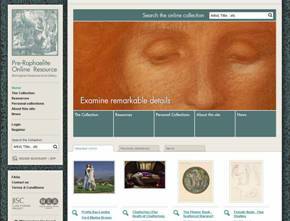 The database presents 900 19th century French drawings from these two collections as well as some sheets from the The Peabody Institute Art Collection (see the following site). 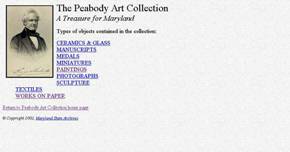 The Peabody Art Collection is a collection without a museum which used to belong to the Peabody Institute of Baltimore and which was acquired in 1996 by the state of Maryland. The largest part of the holdings (1,400 objects in all) is made up of 1,100 drawings and watercolors. Many works have been distributed among various establishments (the Baltimore Museum of Art, the Walters Art Museum, the Maryland Historical Society, the Homewood House Museum, the Peabody Institute and the Maryland Institute College of Art). A revolving exhibition is presented at the Miller Senate Office Building in Annapolis.